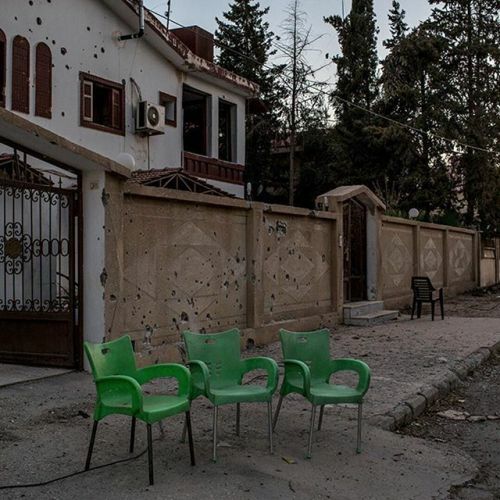 “A damaged house on the outskirts of Hasaka, #Syria, not far from the location where a coordinated airstrike recently killed nine Islamic State fighters. In recent months, the United States has coordinated with a Kurdish militia known as the Y.P.G., resulting in significant setbacks for ISIS across an enormous strip of northern Syria near the Turkish border. Now, as a new deal has been reached with Turkey to allow American aircraft to fly combat missions from bases closer to the border, the U.S. air campaign is poised to expand. @limauricio photographed Hasaka on #nytassignment.” By nytimes on Instagram.